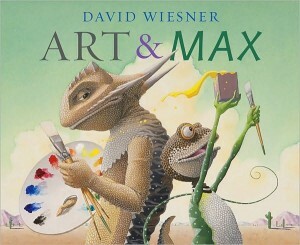 Although this is really a review of the children’s book Art & Max by David Wiesner please indulge me for a moment. I’d like to begin with a quote from another author. The responses always followed the same pattern. In kindergarten and first-grade classes, every kid thrust a hand in the air. In second-grade classes, about three-fourths of the kids raised their hands, though less eagerly. In third grade, only a few children held up their hands. And by sixth grade, not a single hand went up. The kids just looked around to see if anybody in the class would admit to what they’d now learned was deviant behavior. Phew. Thank goodness that didn’t happen to David Wiesner. Had he been discouraged from expressing himself through art we wouldn’t have been given his adventurous tale of Art & Max. Had he believed that art is just for kids we wouldn’t be able to imagine him in his studio having a good laugh as the idea for this beautiful book came to life. As the story of Art & Max begins we see that the fate of many school children described above almost befalls Max. Max, an enthusiastic young painter, is eager to show his slightly grumpy friend Art, oh excuse me – ArtHUR, what he can do. This is not a story about artistic talent, although clearly the award winning author/illustrator has that in spades. In many ways this story is about friendship and what happens when creativity is given the freedom to fly. You’ll never guess what happens when Max picks up his paintbrush. No, seriously, you’ll never guess. And don’t ask me to give the ending away. Let’s just say the outcome is… surprising. And fun. And oh so colorful. Art & Max, with its imaginative visual storytelling, its explosion of color, and its beautiful, engaging imagery is a delight for any creative spirit. David Wiesner is doing his part. Through his own example and through the adventurous transformation of his characters, he sets the “deviant” in all of us free. To learn more about David Wiesner’s children’s books and some fascinating information about his creative process visit his website.